The Radial Tip Fan delivers high static efficiency while resisting material buildup on the wheel/impeller. 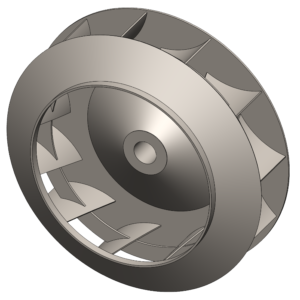 A radial tipped blade design keeps dust and other particulates moving through the wheel to exit fan. It offers induced draft air for both clean and dirty air applications. handle both clean and dirty airstreams. The RTHS design offers the high efficiency of our backward inclined fans combined with the capability found in our radial fans to remove particulate and other pollutants. Our centrifugal radial tip fan often serves more custom applications in moving corrosive and saturated air. The fan airstream parts can include stainless steel construction along with other alloys. Other custom features include epoxy coatings and special linings. The RTHS fan continues a track record of success in providing process air to many industries. Customers rely on its years of consistent and reliable service to keep their facilities running and production strong.